Could We See Baseline Branding Soon in the NBA? Are you looking for a new inventory piece to sell in the NBA? Are you interested in how sponsorships are being sold in foreign basketball leagues? 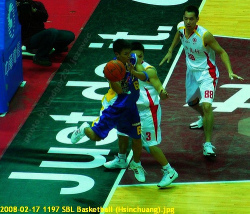 Consider baseline branding, a tactic implemented by the Super Basketball League (SBL) in Taiwan. Founded in 2003, the Super Basketball League is the top tier professional basketball league in Taiwan. As the pictures to the right demonstrate, the SBL has aligned with Nike to brand the basketball court's baselines with Nike's symbol and "Just Do It" messaging. While Nike's on-court branding appears sharp and pleasing to the eye, it does make the court look very commercial and is an inventory peice that professional basketball organizations could swing either way on. However, it's only a matter of time before an team tests the waters with this asset, especially for a area naming rights partner. Then again, take a look at how the SBL also incorporates corporate messaging into the paint... Could that signal a future trend as well?